I mean your babies no harm. This Christmas, I received a couple of poetry-related gifts. The first was an original hand-drawn and illustrated version of a haiku I wrote. It was done by my talented and thoughtful daughter-in-law, Sarah. I had written this haiku last year in honor of my late father. Now, it is I who feel honored and delighted! This is as close as I’ve ever come to having an authentic version of an original haiku. The old haiku masters produced total works of art, complete with beautiful hand-lettering and illustrations to complement the poignant words. The idea for the verse came about while going through my parent’s belongings before getting their house ready to sell. I came across my father’s old Bible. It was so well-worn that it was literally being held together by duct tape. My father never finished high school, and spent his life as a farmer and mechanic. He didn’t travel, and he had no hobbies except for studying the Bible and ancient times. He became a bit of an amateur scholar, ordering books on theology and history. I packed up a few of books to pass along to my scholarly son, but the prized possession from the old house was that Bible. Now, my prized new possession is this illustrated haiku. Dad was not just interested in history for history’s sake, or out of a mere intellectual curiosity. He also had a deep faith. He had seen the difference that God had made in his own father’s life and he believed in Jesus as well. He did his best to introduce his own children to that faith. I’ll write about my other poetry-related Christmas present in a subsequent post soon. 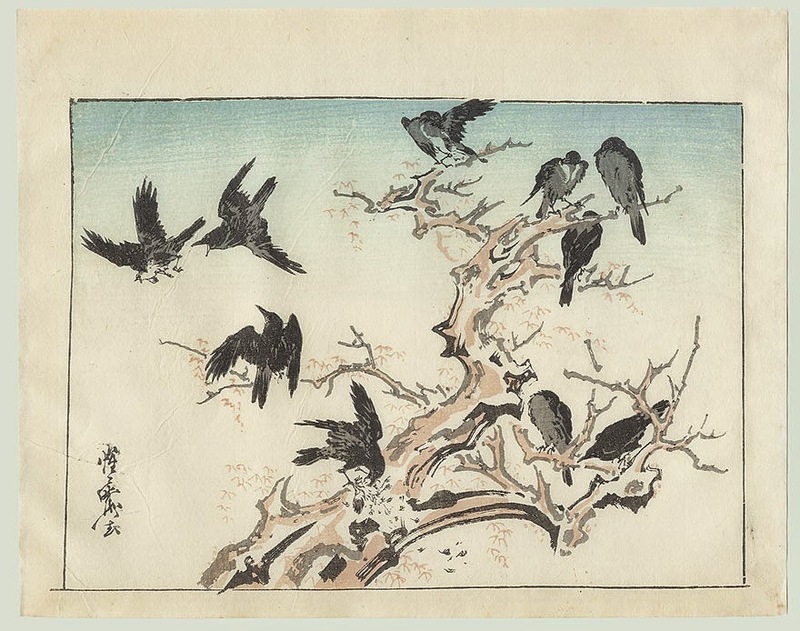 Crows show up in some of the most poignant haiku. They are such marvelous creatures, it is not surprising they captured the notice of the haiku masters. Spring came early to western Washington this year. On a recent walk, I encountered some crows who were very upset about my presence.